The Montecristo No.4 is full of flavor, warm and mellow when properly aged. •	The thin ring gauge means this is a very direct and rapid burn and its responsiveness does not wane as it burns. •	A rich and exciting blend like this needs some age to be at its best. Wonderful tastes throughout to delight the palate. Always consistent burn and draw. The Montecristo No. 4 is a very well-constructed, very firm and well packed. Incredibly beautiful maduro wrapper, oily and silky. 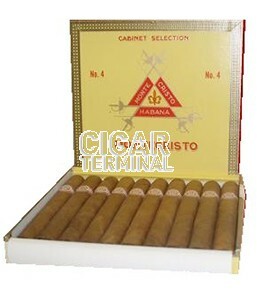 The cigar is very well constructed, very firm and well packed. Smooth, oily, chocolate wrapper, with little veins. Semi-box pressed with a lightly colored wrapper and nice cap. The cigar lights up very easily. The draw is on the firm side, as expected from the beginning, but it's not unpleasant. Razor sharp burn. It is medium bodied in the beginning, with strong taste of earth and wood, with hints of spice. The cigar loads the palate with nutty notes and a hint of graham cracker. The draw is slightly looser, but still firm. The flavors are more complex, with the earthy flavor being more intense. The tones of creamy coffee and caramel appear. Spice, wood, cocoa and fruits, all well balanced, deliver full and balanced creamy flavors. A lot of aging potential. In summary: completely full Cuban flavors of mocha and spicy robust zest.